If you have a surgery scheduled, Surgery Partner is a must have. Four separate hypnosis programs include Before Surgery, During Surgery Recovery Room Wakeup, and After Surgery Healing are pre-loaded onto our MiniClip mp3 player. If you have a surgery scheduled, Surgery Partner is a must have. Four separate hypnosis programs include Before Surgery, During Surgery (to listen to while you are having the surgery) Recovery Room Wakeup, and After Surgery Healing are pre-loaded onto our MiniClip mp3 player. It comes complete with headphones and USB cable. It has been proven that if you are having general anesthesia or local anesthesia, your subconscious mind listens to the hypnotic suggestions contained in this effective program (read the research paper under the “Our Science” tab). Check with your surgeon or anesthesiologist if you can wear headphones during your procedure – most are quite agreeable. You are sure to have a much better surgical experience and faster healing using this program or we will refund your purchase price. 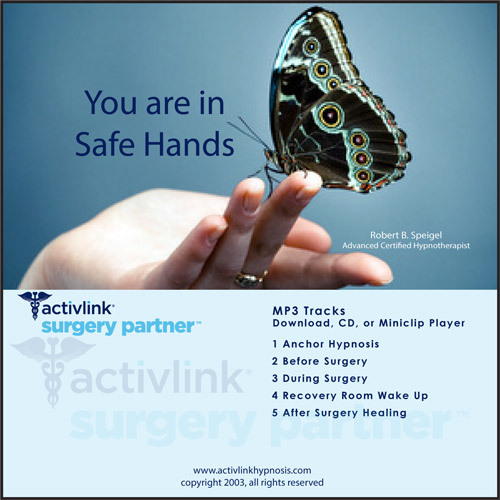 I recently used the Activlink Surgery Partner mp3 system as a support tool in preparation for surgery and for the healing time afterward. I would highly recommend this product. The use of this meditation helped to calm me, particularly whenever my mind would spiral into scary places leading up to my surgery. Using the guided meditations and visualizations after surgery helped me to feel as if I was playing a very active role in my healing and recovery. To validate the calming effect this tool had on me; the nurse who took my blood pressure during my check-in before surgery was stunned at how low it was and commented that I was “certainly in a Zen place”. I truly felt that way.